Crisp Skillet Sea Bass with Pistachio Butter. Could I BE any more excited to tell you about this fish? I want to jump through my screen and have at it; I’m annoyed that it’s not currently sitting in front of me because I want more. It’s light and rich and delicious and filling all at the same time. I can’t even stand it. It’s so a Monday recipe too. Like hey, eff you Monday. It’s simple and versatile and loaded with flavor. We don’t eat sea bass often, but it is one of my husband’s favorites. I’ve been lucky enough to find some frozen wild caught pieces at Whole Foods and we have enjoyed them so, so much. Mercury smercury. Lately, we have been HOOKED on fish tacos. I’m talking at least once a week. Every kind of fish you can imagine, whatever good stuff I can get my hands on. But sea bass has so much flavor… and I didn’t want to lose the pistachio butter in a smashed taco, so I made… sort of… deconstructed tacos? First though, the most important part: the butter. Oh mylanta. This crazy butter is like the condiment of the gods. It is so fabulous. I mean, sure, I’ve been a tad bit pistachio infatuated the last, oh I don’t know, two years or whatever. But this is nuts. Pun so intended. It’s so fanfreakingtastic that I don’t even have words. And it’s not even that big of a deal: roasted, salted pistachios, churned into crumbs and stirred into some softened sweet cream butter. Like I have died and gone to heaven. Seriously. I’m dead. We ate this fish with a slaw on the side. Actually, it’s kind of like a salsa. Hence why I have named it a “slawlsa.” It’s a salsa in slaw form. It’s ridiculously fresh and delicious and tastes like summer and Eddie is even eating on eggs in the morning. Weird, but a testament to the tastiness. In addition to that, I threw together some makeshift tostadas. I simply crisped up a few tortillas and once they cooled, torn them into pieces. Seriously LOVE doing this. The rustic shape of this faux nacho makes it perfect for scooping up remnants on the plate. If you want to eat the fish with the tortilla, scooping some on top of the tortilla and eating in nontaco form keeps the flavors separate. It’s just SO good. Oh but P.S. 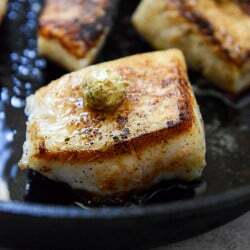 you can totally do this with whatever fish you desire – other flakey white fish or your favorite tilapia. If you need to avoid high mercury fishies for any reason, make it your own. The moral of the story is PISTACHIO BUTTER. To make the salsa/slaw, combine all of the ingredients in a large bowl and toss well to combine. Place the slaw in the fridge until ready to use. To make the crispy tortillas, heat a large skillet (I like to use a cast iron skillet and then I’ll cook the fish in the same one) over medium-high heat. Add the olive oil about 1 tablespoon at a time and once it’s hot, add a tortilla to the skillet and cook on each side for about 1 minute. The tortillas should be golden and slightly puffy. Remove each from the skillet and allow them to rest on a paper towel to cool, then tear them into pieces. Pat the fish completely dry with a paper towel – this is important because it helps the outside of the fish to crisp up. Season both sides of each piece with the salt, pepper, paprika and garlic powder. (If you love any other spices, you can add them in here.) Heat a large cast iron skillet over medium-high heat. You want it hot. Once hot, add the olive oil and butter. As soon as the butter melts, add the sea bass into the skillet and cover, cooking for about 3 minutes. Gently flip the fish (it should be deeply golden and crisp on the skillet side – if it isn’t, your skillet needs to be hotter) and cover the skillet again, cooking for an additional 2 to 3 minutes. Turn off the heat and keep the skillet covered for another 1-2 minutes. Remove the cover and scoop a small amount of pistachio butter on top of each filet. Serve immediately with the slaw and crispy tortillas. Um look at that melty butter? Can’t even. PISTACHIO BUTTER IS A THING?! How did I not know. I LOVE sea bass. Actually, I like all things from the sea. But, especially sea bass. Your fish looks outstanding! One of the only fish recipes I have on my site is for an orange-glazed sea bass with champagne vinegar. It’s such a beautiful fish to work with and yours turned out so pretty! That great sear. Then the mango and the pistachio butter! Wow, this is just packed with flavor! I want to make pistachio butter now too! So many interesting and utterly delicious things going on in this dish, I love it! I totally support the deconstructed fish taco idea. My husband’s favorite fish is sea bass, too, but I’ve never made it at home. I will have to look for the wild-caught stuff in the freezer section. This recipe will be the one I try if I find some! Hmm, I love sea bass. And topped with pistachio butter? Sounds amazing! Never would have thought to make a compound (if I can call this that) butter with nuts! I just fainted at the words pistachio butter. YUM. This looks delicious! Would love your go-to fish taco recipe. I’m just starting to experiment with making my own! Oh YUM!! I adore seafood and all the colours here remind me of summer. It seems soooooo far away but reading/eating recipes like this give me hope that our snow will melt eventually! I think I could eat the pistachio butter by the spoonfuls! Your fish dish looks just amazing! I bet this butter and fish paired together was amazing!! I must try this! YES! Amen to pistachio butter. And that fish. It’s screaming my name! Oh mylanta indeed. Pistachio butter for president! Fish tacos are fab, great take on making them deconstructed! THAT PISTACHIO BUTTER IS NUTS! I think I need to make this happen over spring break! Waw! The closes Whole Foods is an hour away! I miss Boston for the fresh seafood! Remember turning your fingers red from eating pistachios! Omg everything about this meal is perfect. I love sea bass but usually only order it out…. Now I definitely need to see if my local Whole Foods has it! I am in love with this pistachio butter. Absolutely genius idea Jessica! I’m sold! Um so I don’t eat fish but I really want that pistachio butter – what else can I eat it on?? I’m thinking some kind of grilled cheese…?? Omg. I’m starving. As soon as I read your comment, the words “waffles” and “french toast” popped into my mind. WAFFLES OR FRENCH TOAST WITH PISTACHIO BUTTER. Oh my god I just made myself hungryyyy. this recipe makes me crave summer! yum. I love sea bass and I already know I will love this pistachio butter. I can’t wait to make this! This looks so good! I’m about to start cooking and this totally inspired me. I love a good crisp on any seafood! YUM! I think you should write an entire book on Slawsa. I love this. OH MY GOODNESS. I can’t even… This looks beyond amazing. The sea bass is perfect and that butter is to die for!! It’s like you live inside my brain and know all the foods that make me oh-so-happy. Definitely making this. THAT is a serious sear. Scrumptious. Oh man. I seriously wish that my fiance liked fish! I loooove it and he won’t touch it :( And you totally had me at “pistachio butter” holy yum. Pistachio butter?!? You are seriously my food idol. Genius things come from your brain. It almost physically hurts, how good this looks. Already done my grocery shopping for the next two weeks, but this will get a turn soon. Thanks! Brilliant! My boyfriend LOVES pistachio, I’m definitely going to try this this weekend. I am always looking for new ways to prepare fish, this sounds great! Definitely different from any recipes in my repertoire! I want to slather that pistachio butter all over a baked potato and then crawl into the bowl with a spoon and never come out. Gorgeous! That butter – swoon!! I would make this for the butter alone. Yum!!! We love pistachios, the best nuts! What an amazing meal, this is a dish both my husband and I would love. That pistachio butter……ohmygoodness. And crispy white fish is my absolute fave. This meal sounds so dreamy. I can’t even form a coherent sentence. Ah Mah Gah. This looks amazing. I had to delurk just to tell you that. AAAAAAAAAAAHHHHHHHHHHHHH I WANT. i think you could try any nut that you love! as long as you like, it will work. i will say though, i can’t imagine using peanuts. i wonder if you tried marcona almonds or candied pecans?? Thanks for the EXCELLENT directions, I have never made fish, and I want some omega-3’s so this looks GREAT! Also, feed me this into my life. I recently tasted a white fish called PAICHE sold at Whole Foods. OH-MY-GAAAD! You have to try it. White, thick, buttery. Unique. Question: I bought the 21 spices from Traders Joe (thank you for advice) and want to know what is the best garlic salt you know of?